Yesterday, on the Pont de l’Archevêché in the 5th arrondissement, Paris City Hall held a press conference to officially announce their anti-“love lock” campaign. Vanessa Panetto, head of communications for the city spoke to some 20-odd journalists about the plan for addressing the “love locks” problem plaguing Paris. This was the first time City Hall publicly threatened a ban on “love locks,” though when asked by journalists present, Panetto would not commit to a date when a ban might be imposed. 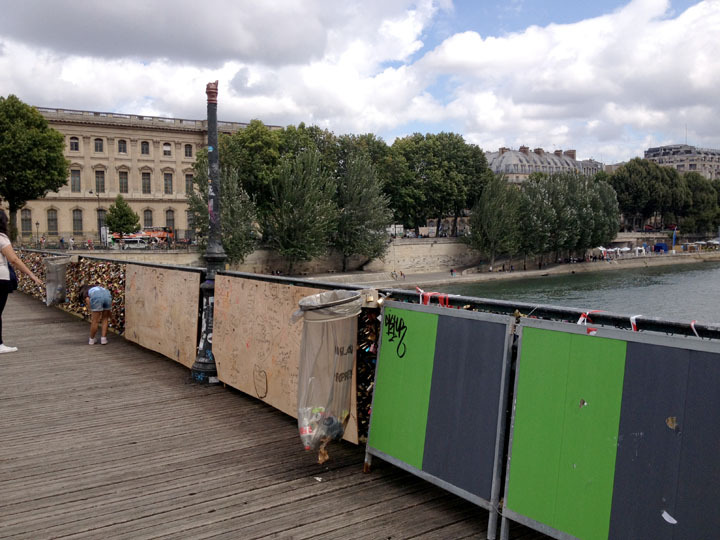 Meanwhile, after three months of heavy tourist traffic, the Pont des Arts has nearly 20 panels in some state of collapse, many covered by plywood boards or construction barriers. 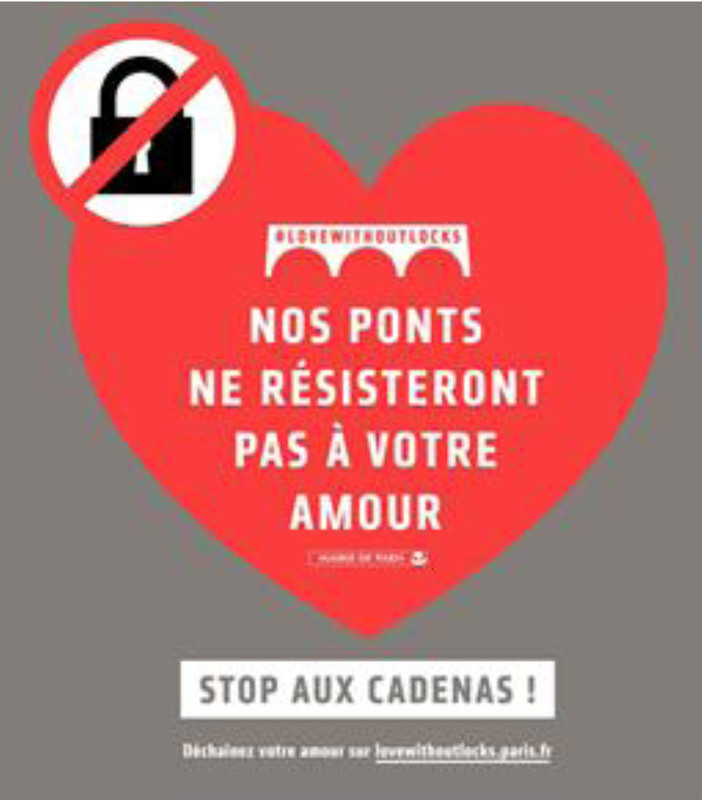 In addition to the selfie campaign, the city of Paris has placed 23 large stickers on the Pont des Arts and Pont de l’Archevêché urging love-lockers in French, English and Spanish: Our Bridges Can No Longer Withstand Your Gestures of Love. NO MORE LOVE LOCKS! It remains to be seen if tourists will heed the new campaign, especially since they have not been dissuaded by the obvious signs of damage the locks have caused. But it is encouraging to see City Hall finally taking a stand. In the end, though, they may have to take out that big stick—in the form of an outright ban on “love locks”—before Paris loses some of its most cherished landmarks. The Pont des Arts after 3 months of heavy tourist traffic. Tourists hang locks, unfazed.